I’m going to focus more on the new and updates in this review. The fx-CG50 is an update of the popular 2011 Casio Prizm (model fx-CG10 or fx-CG20). The fx-CG50 has an updated keyboard, in the style of the new fx-260 SOLAR and Casio FX-991 ES. As a result, the keys are easier to read, more consistent to the touch and size. In the previous keyboard (fx-CG10/20), the number keys were large but the function keys were very small. Like the previous fx-CG10/20, the diagonal of the screen is 3.17 inches. However, the screen of the fx-CG50 is brighter. Although I wasn’t able to find anything about the chip or its speed, the fx-CG50 seems to operate faster in accounts. On the fx-CG10, the program took 1 minute, 24.83 seconds to complete. With the fx-CG50, the program took just 34.87 seconds, a reduction of 58.89%. Also textbook entry, calculus, and full complex number (yes that includes exponential, logarithms, and trigonometric functions of complex numbers – yes I’m happy about this!**). Base calculations include binary, octal, decimal, and hexadecimal integers. Additional modes include Geometry, Conversion, and Spreadsheet. 3D graphing is new to the fx-CG50. The 3D graphing mode offers one of four possible types: line, plane, sphere, and cylinder. Each of the types offer various formats to enter coefficients. Keep in mind these are the only four types of 3D graphs offered. The graph has full zoom features and it is pretty snappy with regards to rotation. Physium is included with the fx-CG50. 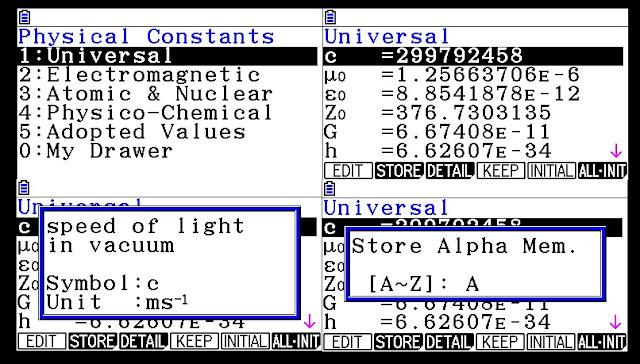 There are two features with the Physium: Periodic Table and Physical Constants. 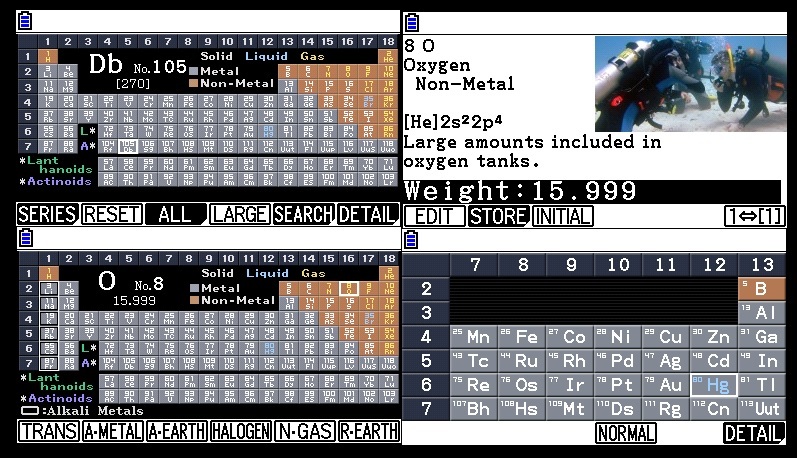 Periodic Table: an underrated feature. You can display the entire table, or zoom in to a portion of the table. The atomic weight of each element can be stored in a variable (A through Z). Physical Constants: Choose between 39 physical constants from five categories: Universal (speed of light, electric constant, Newton’s constant of gravitational, etc. ), Electromagnetic constants, Atomic & Nuclear constants, Physico-Chemical constants (Avogardo constant, molar gas constant, etc), and three Adopted Values (Josephson constant, Klitzing constant, standard acceleration of gravity). Units are in SI. If you don’t have a Casio fx-CG10/20 and are interested in getting the updated version, go for it. I also think getting the update is worth it primarily for the faster processing speed, brighter screen, and much better keyboard as far as contrast on the labels and key size. Obviously Casio is very consistent with the programming language, so if you are upgrading from a previous non-color or three-color version, you should feel right at home with the fx-CG50. The one thing I wish the fx-CG50 had was more RAM instead of only the 60KB from fx-CG10. It’s not terrible, but given the TI-84 Plus CE has 128K RAM, Casio should have at least matched that amount. A small notice:in the style of the Casio FX-991 EX (ClassWiz). With CG50, i did integral from minus infinity to plus infinity of e^(-x^2). It should have given the answer sqrt (pi) but it gave zero as an answer. Please try it and let us know if you have the same problem. 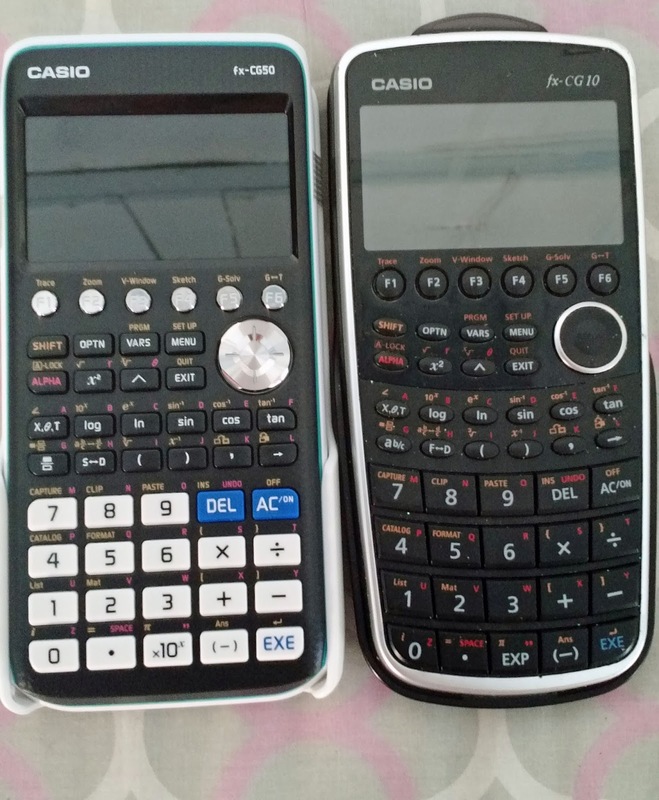 Does cg50 or cg10 or cg20 can have internet connectivity and also word programming allowing document typing..
No, none of these calculators (themselves) have internet connectivity or Wifi. There may be a text editor program, that will require a search, as I don't believe there is a text editor as a default. I have a problem. 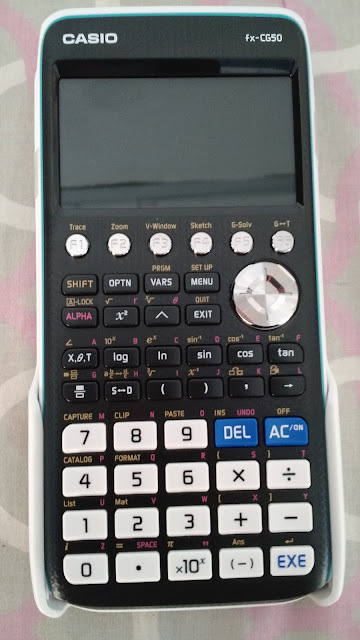 I use this calculator in high school (I live in Germany), but when I try to (for example) calculate the sin, cos and tan of (3:5), I do not get the right degrees. For the sin, it says 0,6 while it actually should be 36,9. What can I do to make it work? Check your angle setting by pressing [SHIFT] (SETUP). sin^-1(3/5) about 0.6 radians, which is about 36.9 degrees. On my fx-115 Plus it is above the "(" but not on the CG50. Question 2. 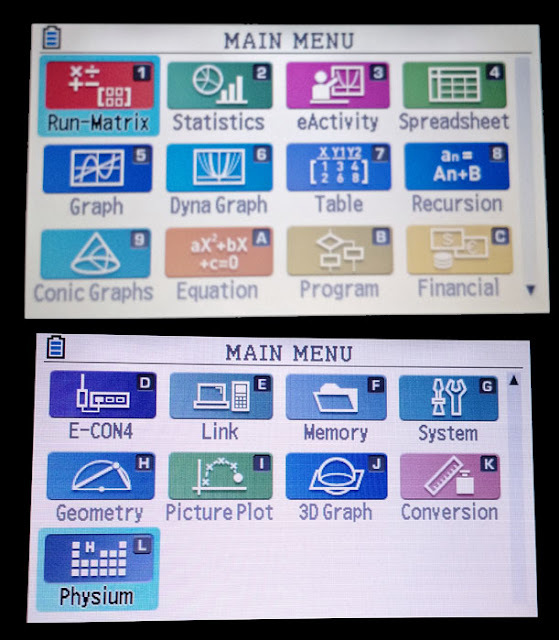 Are there math lessons on line or in a workbook form that will teach you to get the most out of the CG50's many functions on the Main Menu? I tried to label a column with test on the Spreadsheet and instead of entering text, it came up with"0" for the cell. Text entry seems very difficult or at a minimum cumbersome.